Butter, cream and chocolate. The fascinating collaboration of unhealthy foods. Umm, bad things are so tempting and delicious. 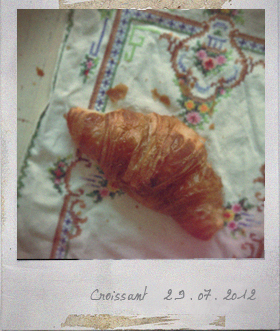 Cut the croissants and dark chocolate into small pieces. Mix the eggs and 50g of sugar in a large bowl, and whisk in the single cream, milk and a dash of vanilla extract. Divide the chopped croissants and chocolate between 4 ceramic tea cups (200ml capacity per cup). Pour the cream mixture over and leave to soak for 30 minutes. Sprinkle with sugar on top of each cup (1/4 teaspoon of sugar par cup). Put the cups in a oven dish and pour in enough hot water around the cups. Bake for 35-45 minutes until the pudding is just set and golden. 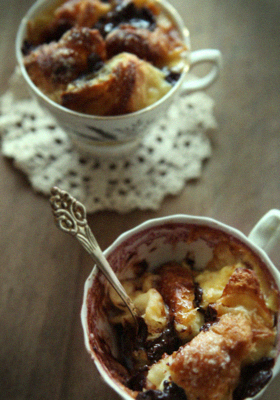 § 2 Responses to Chocolate Croissant Pudding Cups"
Looks absolutely delicious! I would love to try some. Hopefully I can recreate the recipe just as well as you have made it. You are currently reading Chocolate Croissant Pudding Cups at Fish Trip Cafe.